Implementing mammography screening of high-risk women, providing additional diagnostic information relating to the staging of breast cancer treatment, and evaluating response to neoadjuvant therapy has increased dramatically by community hospitals and imaging centers. As a result, more radiologists are identifying extramammary findings (EMFs). However, no evidence-based guidelines specifically address the management of EMFs, especially for newly diagnosed breast cancer patients. A multidisciplinary team of physicians at the University of Iowa Carver College of Medicine in Iowa City conducted a study published in Clinical Breast Cancer that showed the overwhelming majority of EMFs did not affect treatment management for breast cancer patients. Although limited to a single institution, their findings of an analysis of breast MRI scans in 772 women showing that the overwhelming majority of findings were benign may provide reassurance to radiologists, referring clinicians and to their patients. The objective of the study was to determine how EMFs correlated with patient and tumor characteristics, the indication for MRI, and the frequency of upstaging to stage IV disease in cancer patients. They also wanted to determine whether reporting an EMF in women who were newly diagnosed with stage I to stage III breast cancer affected the time interval before the first cancer treatment. A total of 1,305 breast MRI scans were performed in the 772 women during a six year period commencing January 2007. EMFs were identified in 113 patients and 10.7% of the MRI scans. Of the 140 MRI studies with EMFs, 89 were in the liver, 21 in bone, 10 in the lung parenchyma, nine were pleural or pericardial effusions, and eight were vascular. Patients with EMFs tended to be older and to be postmenopausal. Principal investigator Mary C. Schroeder, Ph.D., of the Division of Health Services Research in the university’s College of Pharmacy, and colleagues speculated that benign EMFs – such as vascular findings - identified in this older, postmenopausal group might be related to aging. Approximately 22%, or 81 patients, who were newly diagnosed with breast cancer had an EMF. 59 (6.7%) patients who had the breast MRI because they were high risk or had a clinically significant breast examination finding had an EMF identified. Only eight patients out of the 113 with EMF findings were upstaged to stage IV breast cancer because the EMF represented metastatic disease. These eight corresponded to less than one percent (0.6%) of the total number of breast MRI examinations performed through 2012. The majority of metastases identified were in the bone, specifically in the sternum. Two metastastes were identified in the liver and one was a malignant pleural effusion. The authors noted that prior published studies also determined that the liver is the most common anatomic site of an EMF, and that a contrast-enhanced liver MRI is an accurate method of determining whether a hepatic lesion is benign or malignant. The concern that identifying an EMF would delay cancer treatment proved to be unfounded. In fact, patients with an EMF on average underwent surgery three days earlier than patients without an EMF, and the time for delivery of systemic therapy was comparable. Phadke S, Thomas A, Yang L, et al. Frequency and Clinical Significance of Extramammary Findings on Breast Magnetic Resonance Imaging. Clin Breast Cancer. Published online August 28, 2015. 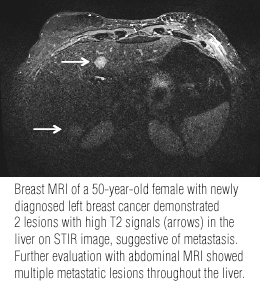 Incidental extramammary findings on breast MRI. Appl Radiol.